Istria Outside My Window: It’s asparagus season! You know it’s really spring in Istria when the wild asparagus appears. One month ago a neighbour told me he was going to pick asparagus. “Is it already asparagus season?” I asked, surprised, since the weather was still cool and not very spring-like. 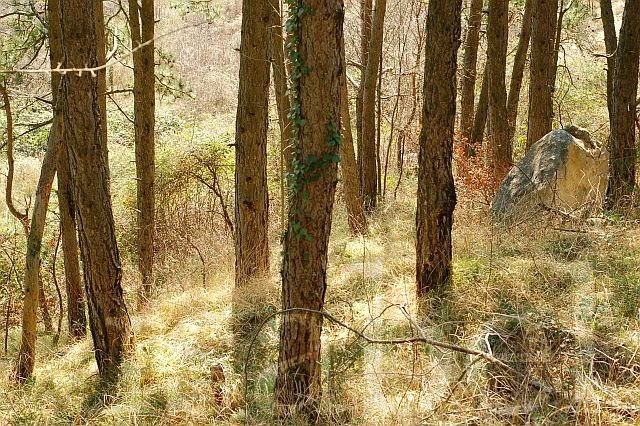 He replied that he had already found a few spears of wild asparagus in the woods. Wild asparagus is a delicacy here. The stalks are much thinner than the kind you find in supermarkets, and the taste is a lot sharper. They’re delicious – and full of vitamins and antioxidants, like all plant foods. A few days later, I saw bunches of wild asparagus for sale at the Pazin market and couldn’t resist buying some. I asked the woman selling them where she had picked them, since they were still hard to find in this area. They came from the Istrian coast. As soon as I got home I chopped them up and cooked them for lunch but I was a little disappointed. Some parts were too hard and fibrous, and they didn’t seem to have as strong a taste as the wild asparagus I had eaten before. “They probably have too much water because of all the rain,” my aunt speculated – hence the less-pronounced flavour. And the hard parts? I was doing it all wrong. She told me how to prepare wild asparagus: “You don’t cut asparagus – you have to snap the heads off and then keep snapping off small pieces until they don’t ‘snap’ anymore. Then keep the hard, rubbery pieces to make soup.” She also told me not to cook them for too long – to preserve as much flavour and vitamins as possible. Also, it’s best to cook them as soon as possible by blanching them in boiling water for 2-3 minutes. They can then be frozen. Now that the weather has finally warmed up and the days are sunny, wild asparagus is much easier to find. My father showed me what the plant looks like and I was thrilled to spot my first asparagus spears poking out of the ground. Wearing gloves is a good idea because the asparagus plant is prickly. The dark purple or deep green asparagus spears grow underneath or near the long prickly branches of the plant, and sometimes right next to it. Another variety of wild asparagus called bljušt (didn’t find the English name) is also abundant at this time of year. Very similar to asparagus, the tops are usually bent and the stalks a dark purple colour. The next time I cooked asparagus I got it right, and I prepared the asparagus I had picked myself. This time I was not disappointed: they had that distinctive strong flavour – and there were no rubbery bits! 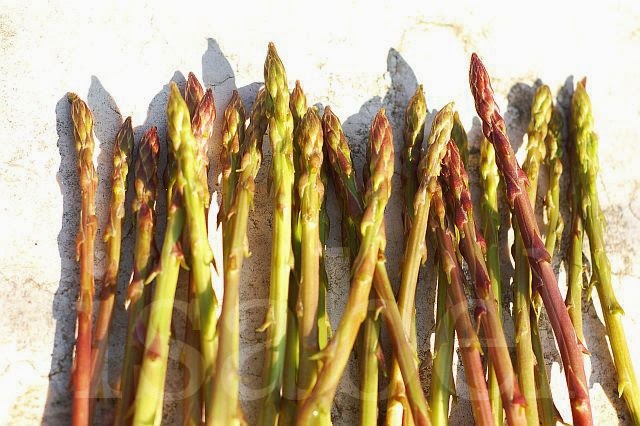 Popular ways to eat wild asparagus and bljušt are scrambled with eggs, in risotto or with pasta. Then of course the rubbery bits are used to make a delicious soup. Wild asparagus is also delicious with a little bit of Istrian olive oil. I also love eating the thin young shoots raw, immediately after picking them! How do you like to eat asparagus? Do you have a favourite recipe? If so, please share it here! This post brings back memories. 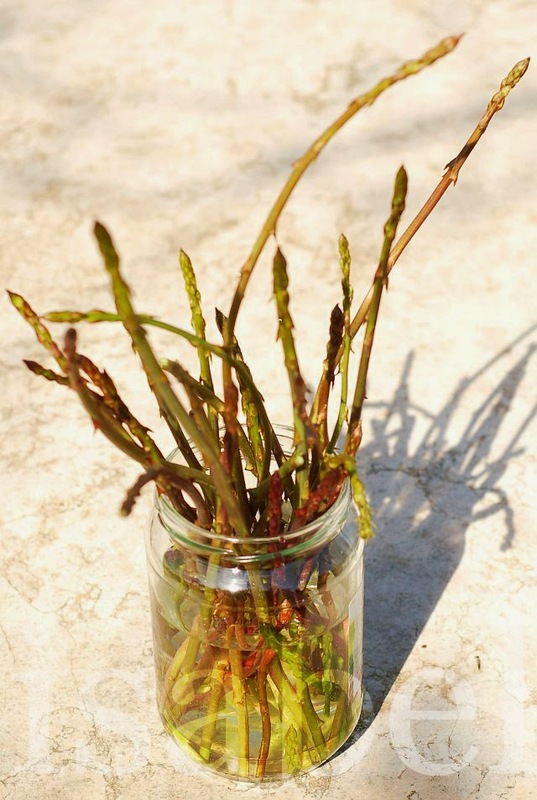 I used to pick wild asparagus each year at my grandmother's house! Lovely. I didn't even knew that asparagus grew in the wild like that! That would be amazing to go out and pick some wild asparagus and prepare it for that evening's meal! I'm glad that your second meal turned out delicious and that olive oil sounds good, too! Simple is usually best - will try your recipe Liz! As a result of not being able to cook it I stay quite indifferent to it, eagerly waiting for the season to end, because a season to follow is a strawberry season!